The tree quilt is finished. I just need some sunshine in order to take a good photograph of it. But it's raining right now. Yesterday was bright and sunny. So, I took a little walk near the water. The plum trees are already blooming. I even saw a Japanese cherry tree almost ready too. The sneak peeks are looking wonderful! We had rain untill this afternoon when the sun came out! What a lovely collection of photos, can't wait to see the finished quilt. I can hardly wait to see the quilt! Your trees are already flowering? That must be wonderful to see. I love spring when my garden starts to wake up. 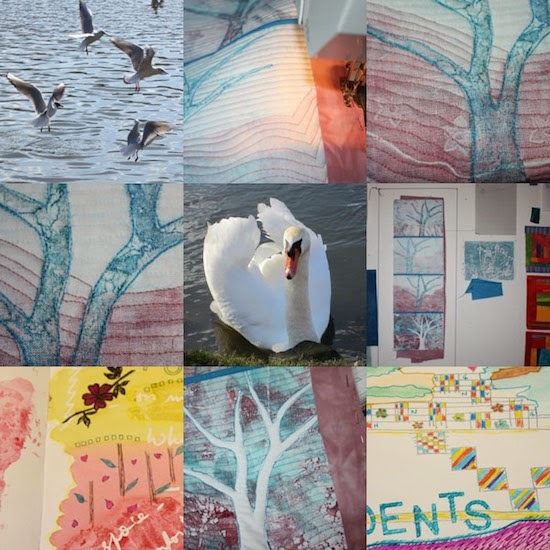 Lovely pics - looking forward to seeing the quilt! Still feels like summer here.